This recipe was one that I had eyeballed right away in a magazine as a must-try. It took me a while to finally cook it, and an even longer while to write about it! (oops) I’m still trying to figure out if I’m going to blog every dish that I cook, or just the ones that my husband and I both enjoy. Thus…I’m working on it. I made these sandwiches on a busy Tuesday night. They did take a little longer than your typical panini, but I feel that these were well worth it. I did make some adaptations to the recipe, based on what I had on hand. Heat a large nonstick skillet over medium-high heat. Add olive oil. To pan, add tomatoes, red pepper, and garlic; saute until garlic begins to brown. Add spinach and cook until the spinach wilts. Add salt & pepper, and set aside. 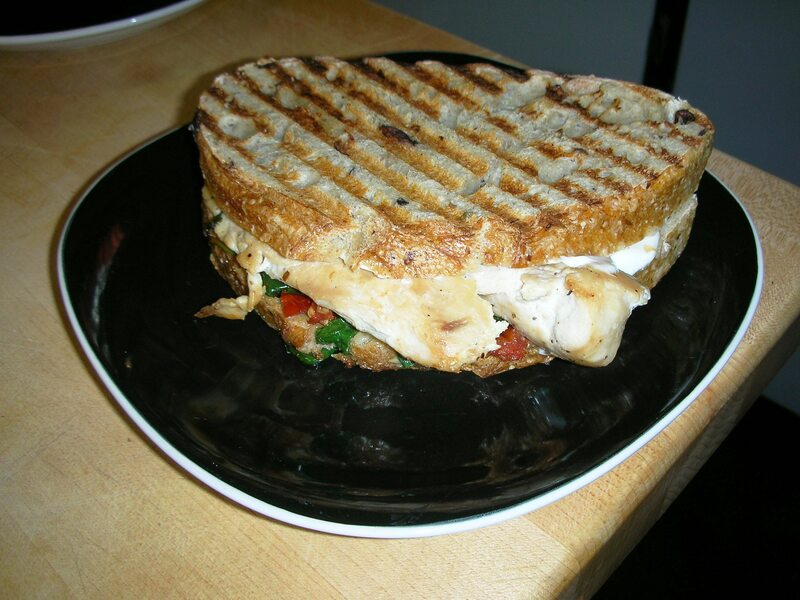 Heat your panini press (or a grill pan) and coat with cooking spray. In the same skillet that you cooked the spinach mixture, cook the chicken, roughly 3-5 minutes on each side, until done. Top 4 slices of bread with some cheese, chicken, 1/4 of the spinach mixture, and a bit more cheese, followed by the remaining bread slices. Cook in pan or on press until the bread is nice and crunchy. I misread the recipe and interpreted ‘fresh mozzarella cheese’ as being from the actual fresh mozzarella ball. I have found that while the flavor is nice, sliced cheese is easier. So, feel free to interpret the above to whatever you wish. In addition, using chicken tenders instead of thin-sliced chicken would suffice. This sandwich is nice with a green salad, or french fries.